I have wanted to bring Aerial Yoga to the studio for a while now and I am delighted to finally be able to release a date of when the first workshops will be. It’s been a long time coming as the research, training, ordering the swings and then finally the practicalities of attaching the swings into the dance studio have all been time consuming activities. Aerial Yoga will give you a new found way to explore the capabilities of your body and mind in a weightless, free-hanging environment. It has all the benefits you get from your Pilates and Yoga practice already, all rolled into one, with a greatly reduced stress on joints, bones and muscles. Aerial Yoga will be in two hourly workshops starting from 6th January, 2019. There are 13 spaces available. This class will be suitable for beginners and will cover a basic variety of moves. It’s your chance to discover how moving in the swing feels, and try out yoga poses that you are probably more used to at ground level. This workshop will be a slow moving, deep breathing, stress reducing indulgence. The swing is a perfect place to hang out and let all the stresses of the body and mind ebb away. Expect gentle poses that make you smile and relax. This is what you’ve all been waiting for, a chance to explore your ground inversions in the safety and free hanging environment of the swing. Don’t be fooled that the swing will do all the work, though. You’ll need a good level of core strength an understanding of inversions for this workshop. You must bring your focus and concentration that you know from your Pilates or Yoga practice to be able to achieve great things in this workshop. Booking available through the website. 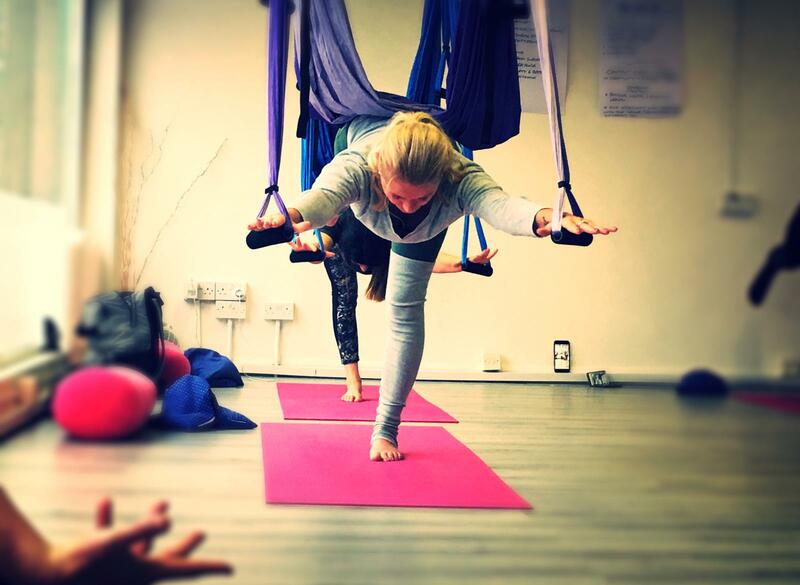 Come and enjoy the weightless experience where you’ll be massaged by the swing into a lovely new, invigorating, relaxing and energising practice.